One of the ways the Palestinian Authority attempts to create a Palestinian history is to deny the Judean/Jewish nationality of Jesus, and misrepresent him as a "Palestinian." Palestinian Media Watch has documented this ongoing Palestinian Authority historical revision. Recently on PA TV, the author Samih Ghanadreh from Nazareth was interviewed about his book "Christianity and Its Connection to Islam." Author: "The Shahid (Martyr) President Yasser Arafat used to say: "Jesus was the first Palestinian Shahid (Martyr)." I heard him say that sentence many times." 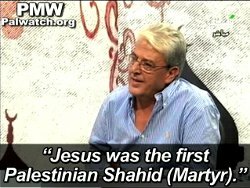 Author: "He [Jesus] was the first Palestinian Shahid (Martyr). He (Arafat) attributed this Martyrdom to Palestine, as well." Click here to see more examples of the PA's misrepresentation of Jesus as a "Palestinian" who preached Islam.